WHO'S THIS EXHIBITOR AT THE 2010 OREGON ORCHID SOCIETY? Many OOS members probably wondered "Who is Margit Bleifus?" when they saw the Oregon Orchid Society display tables at this year's Oregon Orchid Society Show at the Doubletree, Lloyd Center, Portland, because there was a Best Novice Grower card with the plant she exhibited, Dendrobium Yellow Chinsai 'Little Joe' HCC/AOS. 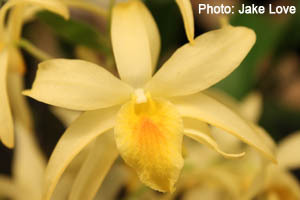 Dendrobium Yellow Chinsai (Chinsai x aureum) is a cross of three species: (moniliforme x unicum) crossed with aureum. My Mom is Margit Bleifus. I was Judy Bleifus before I got married to Brad and became Judy Barrick. Mom got this Dendrobium from me probably seven or more years ago when I got them in wholesale to resell. Mom grows it on a windowsill in her kitchen, above the sink, with a West exposure. Mom has well-insulated windows in her double-wide mobile home so it enjoys growing there year-round except during the very frigid weather we had in early December of 2009, and years before, when it moves down to the countertop. Mom waters it, but not often, and in Winter it gets a dry period during December and January. It "wakes up" to more light as the days get longer. I think I repotted it for Mom about three years ago. It gets fertilized very infrequently, sometimes not for a long time. I sprinkle some water on it when I'm at the sink washing my hands (or humidity). Yet, it blooms faithfully each year in about late February until April. This year, after the show, it also had three late flowers that just finished a few days ago--I'm writing this on June 9. 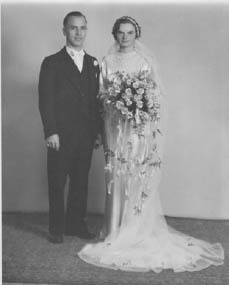 Mom's folks then returned to Germany but came back to visit in the late 1940's. My folks always had a garden but the largest one they had was when we lived in the Richmond Beach area of Seattle. I was very small but can remember the fruit trees, berries, vegetables and flowers in that backyard--it was a huge area. When we moved to a different house in Seattle, I was getting paid to weed at a neighbor's because she said I did a good job and knew the weeds from the garden plants. I had plenty of experience weeding! I can thank my folks for my introduction to gardening and flowers. Gardening is a wonderful pastime and we are all fortunate to have made good friends along the way, long-time friends like those from the Oregon Orchid Society, who don't just grow orchids, most also have wonderful outdoor gardens and plants. Sadly, Dad passed away in 1984 from a stroke and we all lived up on my folks' five-acre farm then where I raised Arabian horses and grew orchids, so eventually Mom sold the farm south of Everett and moved down here to Oregon City to her mobile home park where she's lived for fifteen years. Mom was thrilled to win Best Novice Grower and I got some photos of her at our show. With the money won on this award I purchased another small Dendrobium hybrid, similar parentage, which now shares the windowsill above her kitchen sink with 'Little Joe'. It has blooms in her favorite color--hot pink. I remember the place and time vividly. I was at Kasch's Garden center in Portland Oregon and the year was 1977. They had a little atrium greenhouse off of the main store and they had a lot of different various house plants and succulents for sale, they also had an orchid. It was a truly fascinating plant and I had never seen one before. It only had one flower, but what a flower. It looked fake. It looked like it belonged on another planet. The plant itself was also far different from anything I had ever seen before. It had dark green leaves with a rectangular light green tessellation over the surface as if to camouflage it. The stem for the one lone flower was very round, sturdy, and was as straight as a engineered pole. It was also covered in bristly white hairs. The flower itself was very strange in form and appeared to have only four main parts. It had what I later learned to be a dorsal sepal that was white with dark green stripes radiating from the base and getting smaller and fading at the edge. The Petals stood out at the sides as if they were going to embrace someone. They were green with darker green protuberances at the top edge from which white hairs grew out of as if from a wart. The final significant part looked like a cup. It was pouch shaped and very glossy green, in fact the whole flower was quite glossy and gave the appearance of having been cut out of wax and hand crafted by a master artist. I was awestruck by this strange thing and, knowing still nothing about orchids or how to grow them, I bought it. 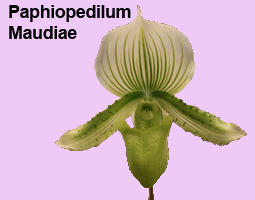 I later learned that it had a name called Paphiopedilum Maudiae. It was also an albinistic variety as the normal type of Paphiopedilum would have lavender or reddish tones to the flower as well as the leaves. New registered hybrids have a rule that they cannot be Latinized, however when orchid breeding was just beginning in the late 1800's they Latinized all of the orchid names. Paphiopedilum Maudiae is a man made hybrid which was registered in 1900. It is quite possible that my first orchid was a division of that plant and therefore technically 77 years old when I bought it. I was hooked on orchids and within a few weeks I had tracked down five other plants and had bought them. I found a old orchid grower who had a greenhouse packed with orchids named Henry O'Brien. He was very helpful in showing me how to care for my new addiction, and before long I had built a small greenhouse of my own. I had in the space of a year well over 100 plants and I seemed to be fascinated with every one of them. I found a local orchid society called the Oregon Orchid Society and joined it. They had monthly meetings with quite interesting speakers. I remember one name Don Wimber who specialized in developing a chromosome changing treatment of seedlings in order to make them more breedable. After many years of growing and appreciating the orchids a friend of mine, who was a orchid judge, suggested that I join the judging system. I was hesitant at first as I knew the requirements were numerous. 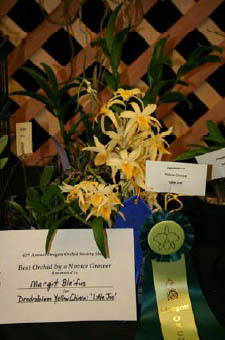 It takes six years to become a accredited orchid judge. You have to attend a minimum of eight judging's a year and submit at least six homework assignments a year as well as attend two business meetings and seminars. Anyway I decided to give it a go, in part because the orchid judges were, I felt, looked up to, and also because I wanted to learn more about orchids. Now many years later when I am myself advising students I tell them that they should not worry about the six years, that after three years they will become probationary judges whose judging scores will count. Having been frustrated about the inaccessibility of orchids in the beginning, I had also decided to start a small business importing, growing and selling orchids. I ran the company as a small part time operation for a few years and then expanded it into a larger full time company called Clackamas Orchids, Inc. I had started with most of the first initial orchids having been imported from their native countries. They came from Thailand, India, Philippines, Indonesia, and Brazil. One of the most interesting companies to deal with overseas was an Indonesian company called Simanis. It was run by a very colorful Chinese-Indonesian named Liem Ke Whe, and also named A Kolopaking (he said in a letter that the Indonesian government asked everyone to have a Indonesian name). He would write these fantastic letters telling me he had to wrestle a 45 foot snake to get a new orchid. Anyway he is the only person I know of that has had two species from the same genus named after him (you have to have two names in order to accomplish that feat, as you cannot have two species with the same name). I usually referred to him as the famous Indonesian thief as I never received all of the plants that I had ordered. He would tell me in a letter (that was written on something approaching toilet paper) that he was sorry, but was all sold out on one or more of the items and that he would give me a credit for the next order. Of course on the next order he would be sold out of even more plants and the credit would grow. One of the most fascinating orchids was a Paphiopedilum (Lady Slipper) that I bought from Simanis. The plant name was Paphiopedilum kolapakingii after the owner and he called it a prehistoric Paphiopedilum (he called anything large prehistoric whether or not it represented a primitive form or a very advanced one). Anyway the plant was huge and I sold it to a friend for $125.00 who was well known for her expertise at growing orchids. 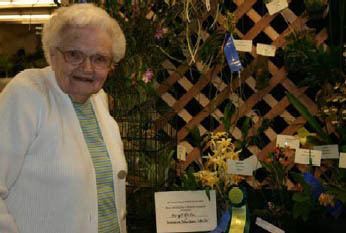 She grew it for several years then received a Award of Merit for it at a judging when it had flowered well. She then grew it into a very impressive sized plant with numerous six foot growths and several bloom spikes that ranged from four feet, to six feet. The largest spike had eleven six inch flowers on it and the Judges gave it a First Class Certificate. Shortly after that she asked me to repot it and asked if I would be able to sell any of the divisions. Well I had never dealt with a orchid of that caliber before so I advertized a division for $5000.00. It sold. Not to a collector, but to a plant broker who resold it for even more money. I have now grown orchids for 32 years and I have thoroughly enjoyed myself. I have made an effort of getting fragrant orchids regardless of their smell. I have encountered the following fragrances in my collection: Vanilla, Chocolate, Chocolate mint, Citrus, Strawberries, Coconut, Fresh mown hay, Menthol, Camphor, black pepper, rotted grass, Moldy gym socks, one week old fish, dead animals, and very dead animals. My favorite is a beautiful and strange orchid called Masdevallia caesia. It has a habit of growing upside down so that you have to suspend it from a basket of moss. The large showy yellow flowers come out and down and draw considerable attention. Every time that is in flower and when a customer notices it I watch them gleefully. They approach the plant with their mouths open in astonishment, then after admiring it for a few seconds they check the bottom of their shows to see what they had stepped in. The orchid smells like very fresh dog poo and everyone has the same reaction while I shamelessly enjoy the show. Different people are drawn to orchids for different reasons. Some see a showy Cattleya bloom and gravitate to it because of its vibrant colors. Others find the miniscule of interest: a bloom spike that's only one inch long and contains 50 flowers. What intrigues one person may not be so interesting to another. While I certainly can appreciate an orchid for its color, shape, size (both large and small), foliage, etc., I seem to always return at orchid shows to a trait that is particularly diverse in the orchid family: smell. Just as orchids have adapted their colors and flower structures over eons to attract specific pollinators, they have, in many cases, developed specific scents to lure creatures to their pollen packets. I am primarily a collector of species orchids. That is, I don't collect many orchids that have been hybridized, but instead I focus on the strain that one would find in the wild. These are the representatives of millions of years of evolutionary development. Their scents are generated by a complex combination of semiochemicals - which are essentially pheromones, a much more common term. 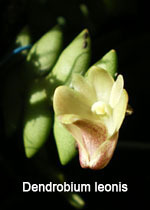 So little is known about what specific creature pollinates specific orchids. Funding for orchid research is virtually non-existent in the United States (Australia and New Zealand are where most orchid research is happening right now). So, with a few exceptions, we can only surmise what pollinates most orchids. My collection has a number of very unique smelling orchids. 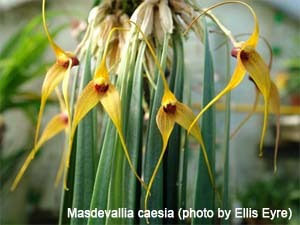 Many people are familiar with Masdevallia caesia and it's foul stench. Pollinated by flies, this smells like fresh dog poop - EXACTLY like fresh dog poop. It is this "exact" mimicry that makes me wonder about certain orchids. We all know flies like poop, but why does my Encyclia radiata smell EXACTLY like lemon cake mix? Is it pollinated by tubs of Betty Crocker frosting? Or one of my favorites, the diminutive Dendrobium leonis, smells EXACTLY like a campfire. A CAMPFIRE! What is attracted to a campfire? Aren't most bugs repelled by the smell of smoke? I currently have Aerides crassifolia blooming. It smells like nail polish. Our Sievekingia ronhofae smelled like Bactine wound disinfectant when it was blooming. I appreciate the orchids that smell just like flowers too. A blooming Stanhopea is amazing as it fills an entire room with its perfumed scent and just as fascinating as the odd smelling orchids are those that can turn their scent on and off like a switch based on time of day. So if you're at an orchid show and you see someone smelling every orchid in a display, it might be me, but I suspect I'm not the only one drawn to the olfactory orchids.